This not the story of a multi-champion show horse a horse that cost thousands of dollars or set new records and standards for the Arabian breed. It is the story of fulfillment of a young girl's dream and the love extended to a stallion and the has more than repaid that love investment. How does one describe a relationship of long standing without being overly sentimental, even though a lump forms in the throat as you remember past events and try to condense 11 years Into a short story. Well, bear with me as I attempt it. 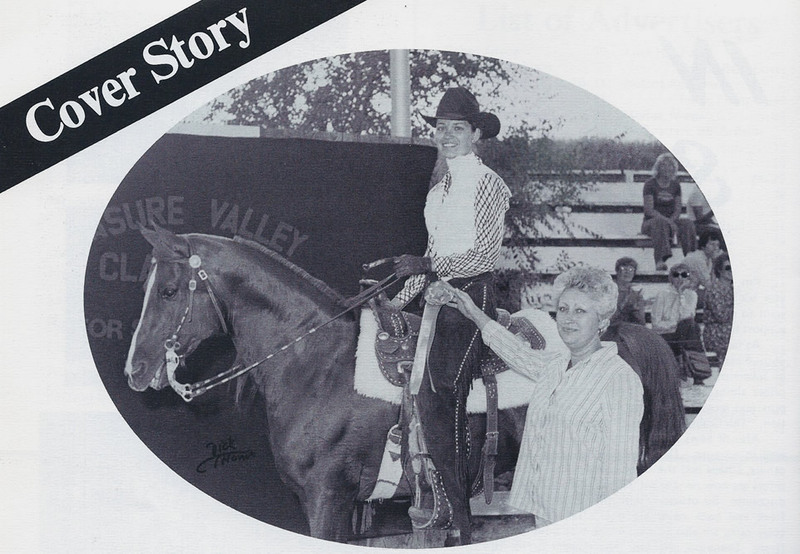 It began eleven years ago, when after progressing beyond the standard grade gelding, my parents presented me with a purebred yearling colt on my 16th birthday. He was the culmination of all my dreams after reading stories such as King of the Wind and the Island Stallion. He was perfection personified. A brilliant chestnut with a perfect blaze and four even stockings. At that point in time there was no thought that he would be the foundation of a storybook breeding program. He was not selected for his superior conformation or bloodlines or his ability to "breed on." He was simply a fantasy, larger than life and we spent every possible waking moment together waiting for him to grow up. As the year's have progressed, this stallion, Belesemo Trad and I have grown up together and trained each other in the proper ways of the world that are considered fitting for a horse and rider. We have gone through many hard times together and several tough lessons, but through it all the bond between us has deepened and we have learned much together. We have not had teachers or training. His greenness and inexperience was only exceeded by mine. It was only a great horse that could overcome the obstacles of a beginner training a beginner — a great horse that needed some recognition for his struggles and the reason for this tribute. "Laddy" as he was affectionately called was six years old before we two ventured up enough courage to compete in a small breed show where wonder upon wonders, we placed in the ribbons. This gave us some incentive and was the inspiration to try harder and read more books. Surprisingly enough as the years ticked by, so did the show ring wins. From Halter, Western Pleasure, English Pleasure, Costume and Driving, everything was taken in stride and the golden stallion has become a champion in all these areas. He has not won every class entered, but he has almost always been in the ribbons. He has competed against other Arabians and against other breeds, under judges who have been to the Nationals and under judges who prefer other breeds, in Class A and Open shows, and still comes out a winner without the benefit of professional help and on an extremely limited budget. And his pedigree? The son or grandson of a National Champion? No . . . . not that you'd notice. However, his pedigree does consist of some of the oldest breeding available to Crabbet/Davenport aficionados. 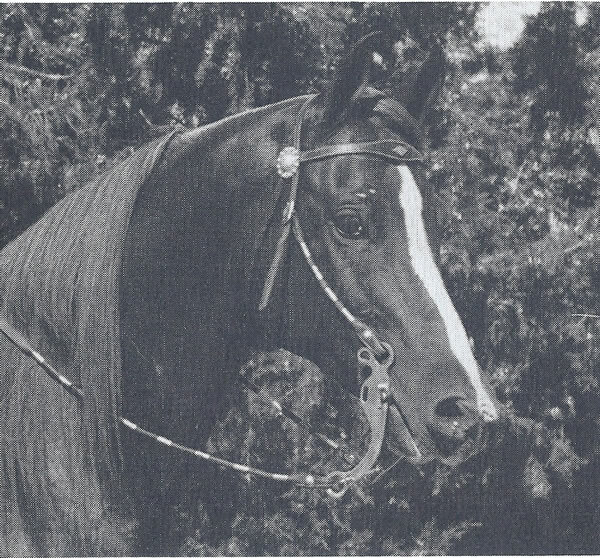 Although you wouldn't recognize some of the names, his sire, Las Trad, was the first horse in the state of Idaho to be eligible for the Nationals in five different divisions for seven consecutive years. 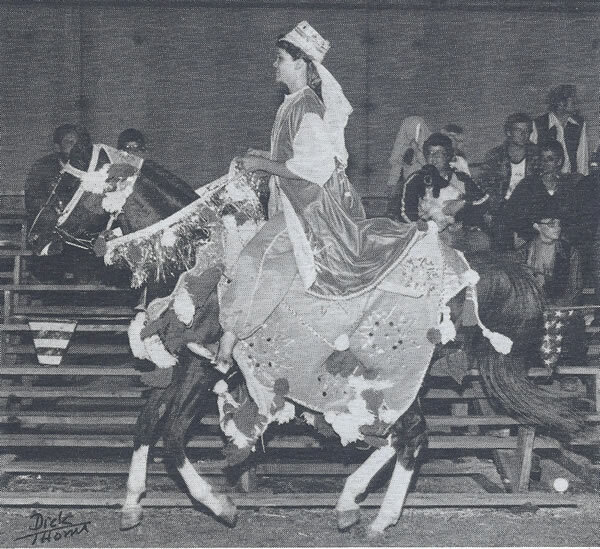 His grandsire, Aniq, was the Northwest reining and stock horse champion over all breeds and the first horse eligible for the Nationals in any division in Idaho. Were they famous horses? No, they were solid Arabian stock, whose owners showed them to their wins and it is left to the rest of us to speculate how far they could have gone with the benefit of professional help. Belesemo Trad's granddam, ZaFarah, was a product of the Walton breeding program, and her dam, Zimada, was one of the three Walton foundation mares. These mare lines are akin to Bey Shah's. On the bottom side, his dam, Alla Mem, is primarily a Davenport foundation mare. All, of course, has not been rosey. We have had some tough times together... Of unaccepted discipline, with a standoff to determine the winner . he is after all a stallion; we have fallen into a large canal and almost drowned; and we have had a runaway down the city pavement with a large semi truck blaring its horn behind us; we have also had people look askance at a young girl with a stallion. These are a few of our bad times. But the good far outweighs the bad ... the joy and sheer pleasure of an unexpected win against professionals; people who own other breeds commenting upon his beauty and good nature; upon being hooked for the first time to a buggy, he just looked around as if to say, "well, get in, let's go," and go we did; his proud strut when in costume at a parade and the delight of the children when he bends down to let them touch velvet nose; and the pride of taking a friend and her groom through the park on their wedding day. These are a very few highlights of an illustrious career introducing people to the "real" Arabian. These highlights make up a special repertoire of memories and have added special friends as a result. The years are swiftly passing and today Belesemo Trad is still our pride and joy and together we are trying to make the foundations for a top breeding program. It's beginnings have been slow, but with my husband, Dirk, whose support and patience has been endless with the horse family he inherited, the last three years have progressed more rapidly. Not stood at stud until he was 8 years old, Belesemo Trad's oldest foals just turned three this year. Those shown at halter so far have always placed consistently high or won their class. They have received such outstanding awards as Reserve Show Champion mare as a yearling. Quality begets quality regardless of price or bloodlines. I do want to stress that without the love and financial sacrifice of my parents in the early years the Belesemo Trad dream would not have occurred. And last, but definitely not least, without the love and support bf my husband, none of the last two years nor the future would be possible. As I gaze out at Ladd in his paddock, I think of all the famous horses which are pushed at us through heavy advertising in breed magazines and all of the heavy show ' 'hype" which surrounds them. My mind drifts and I wonder what this magnificent specimen of an Arabian could have done had he had the benefit of a trainer or a different owner. True, he is only 12, but it seems that is old in today's show ring lingo. And yet, I look back down through the years and I know that all the rides we have been on together, all the times I cried in his ear, and all the "accident's" we've had and survived makes him a National Champion in my heart and mind. To me he represents the thousands of superior quality horses owned by everyday people who will never have the recognition they deserve because their owners cannot afford to give them such they just love them. The Lord has indeed blessed us with one of His most magnificent creatures. This then is our thanks to a very special horse who has filled our hearts and lives in a way that only a truly great friend can — with undying service and loyalty. In the words of Star Trek's Spock: "Live long and prosper, friend." May he give inspiration to all people everywhere and their "Special Friends."